Daughter of Giuseppe and Francesca Cambiagio, she grew up in Pavia, Italy. 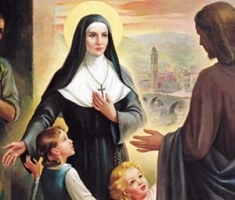 At the age of 20 she had a profound mystical experience that left her devoted to prayer and desiring a religious life. However, to go along with her family's wishes, she married Giovanni Battista Frassinella on 7 February 1816. The couple had a normal married life for two years, but Giovanni, impressed with Benedicta's holiness and desire for religious life, agreed to live continently. The two took care of Benedicta's little sister Maria until the girl's death from intestinal cancer in 1825. Giovanni then joined the Somaschan Fathers, Benedicta became an Ursuline nun. In 1826 ill health forced Benedicta to return home to Pavia. There she began to work with young women in the area. The work sent so well that her husband Giovanni was assigned to help. The schools continued to grow and prosper, and Benedicta was appointed Promoter of Public Instruction in Pavia. However, no matter how chastely they lived, Benedicta and Giovanni's unusual relationship drew gossip and criticism from civil and Church authorities. To insure that she did not get in the way of the work, in 1838 Benedicta turned her work over to the bishop of Pavia, and withdrew to live as a nun at Ronco Scrivia, Italy. Born to a family of relatively wealthy peasants. Soldier who distinguished himself in combat against the break-away canton of Zurich and eventually reached the rank of captain; reported to have fought with a sword in one hand, a rosary in the other. At age 30 he married Dorothy Wiss; they couple had ten children. Cantonal judge and government advisor; declined to serve as cantonal governor. Following a vision of a harnessed draft horse (representing his worldly life as a farmer) eating a lily (representing his spiritual life of purity), Nicholas felt a desire withdraw from the world. With the approval of his family, he became a hermit in the Ranft valley, Switzerland in 1467; he assisted daily at Mass and spent most of the rest of his day in prayer. Reported to have had the gifts of prophecy and of inedia, surviving for 19 years solely on Holy Communion. His reputation for sanctity spread, and he attracted spiritual students. In 1481 he was called on to mediate a dispute that threatened civil war in Switzerland. He succeeded in averting the conflict, then retired to his hermitage. He is considered by many to be the father of this country, honoured by both Swiss Protestants and Catholics for his wisdom, holiness and work to unify Switzerland. Egyptian monk. Ran the famous catechetical school of Alexandria, Egypt. Resigned to spend more time in prayer and penitence. Spiritual student of Saint Anthony the Abbot in the desert. Friend of Saint Athanasius of Alexandria. Bishop of Thmuis, near Diospolis in the Nile delta of Egypt in 339. Fought Arianism. Supporter of Athanasius, and spoke for him in the Council of Sardis in 347. Banished by Emperor Constantius II for his opposition to Arianism. Named a Confessor of the Faith by Saint Jerome. Fought Macedonianism, which denies the divinity of the Holy Spirit. Wrote against Manichaeism, showing that our bodies can be instruments of good or evil, that it is our choice, and that just and wicked men often change; it's therefore a lie to think our souls are of God, our bodies of the devil. Wrote several learned letters, a treatise on the titles of the Psalms, and a sacramentary called the Euchologium, a collection of liturgical prayers. 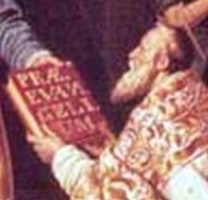 Saint Athanasius wrote several works against Arians at Serapion's request, but thought so much of Sarapion that he told him to revise them as he saw fit. An Irish prince, the son of Conall Derg of Ergall, Ulster. Brother of Saint Fanchea of Rossory who brought him to the Faith. Brother-in-law to King Oengus of Munster, Ireland. Soldier. When he converted to Christianity, he gave up the military life and his dreams of conquest, and planned to marry. When his fiancee suddenly died, Enda renounced his claim to the throne and became a monk. Pilgrim to Rome, Italy. Priest. Studied with Saint Ninian in Galloway, Scotland. Founded a monastery at Killeany on Inishmore in the Arran Islands on land donated by King Oengus. It was the first true monastery in Ireland, ten other houses developed directly from it, and Enda is considered the founder of Irish monasticism. Built churches at Drogheda, and a monastery in the Boyne valley. His houses lived under a severely austere rule, and prayerful men lived in them for centuries. Spiritual teacher of Saint Ciaran of Clonmacnoise, Saint Brendan the Voyager, Saint Finnian, Saint Columba of Iona, Saint Jarlath of Tuam, and Saint Carthach the Elder. Studied at Balliol College, Oxford, England. Converted to Catholicism. Studied at Douai College, Rheims, France. Ordained a priest at Laon, France in 1583. He then returned to England to minister to covert Catholics in Hampshire and Dorset. Arrested and condemned to death for the crime of being a priest. Studied at the Shkodra Pontifical Seminary, and then theology in Bobion, Italy. Ordained on 21 March 1942 as a priest of the archdiocese of Shkodrë-Pult, Albania. Imprisoned and tortured in the anti–Christian persecutions of the Albanian Communist government. His torturers repeatedly ordered him to curse Christ; he repeatedly answered "Long live Jesus Christ!" Martyr. Soldier. Escorted Saint Gabriel John Tauin du-Fresse to Beijing, China during his missionary work. Convert to Christianity. Priest. Worked in the Sichuan apostolic vicariate. Arrested for his faith and his work. He died in prison. Martyr. Canon at Lyons, France. Pilgrim to Compostela, Spain. Benedictine Cistercian monk at Clairvaux Abbey under Saint Bernard. Founded the Cistercian Bonneval Abbey in 1117, and later served as its abbot. Bishop of Valence, France in 1141; he felt so unworthy of the position that he had to be physically carried to the altar to be consecrated. Fought for his flock not just in matters spiritual but for farmers, merchants and the impoverished who were all ruined by debt during a regional financial crisis. As a girl, Lucia was noted for her piety and charity. She joined the Third Order of the Servants of Mary in Verona, Italy, and lived in her house as though it was a monastery. She developed a ministery of visiting the sick, nursing them in their homes, dressing wounds, sitting with the dying, and caring for those struck down with plague until it took her away, as well. Studied at the English College in Douai, France. Priest in the apostolic vicariate of England, serving covert Catholics during the persecutions of James I. Martyr. Married. Mother of one daughter who died in childhood. She and her husband agreed to split up, each entering religious life. Benedictine nun in Gubbio, Italy. Abbess of her house. She moved her community to Santa Maria in Via Lata, the Via Iulia in Rome, Italy where they lived in very strict observance of the Benedictine Rule and became known as Mary's Servants or Le Santucci. Layman in the apostolic vicariate of England during a period of persecutions of Catholics. Martyr. Travelling companion of Saint Peter the Apostle. First bishop of Catania, Sicily, consecrated by Saint Peter. Professor in Salamanca, Spain. Tutor to the children of duke. Canon at Coria, Spain. Franciscan. Monk in the monastery of Fulda, Germany. First abbot of the St-Pantaleon Abbey in Cologen, Germany. Wrote works on theology that were widely read in his time. A large but unknown number of Catholics massacred in several churches during Good Friday services in Alexandria, Egypt by Arian heretics during the persecutions of Constantius and Philagrio. Brother of Saint Romanus of Condat. Monk. With Romanus, he founded the abbeys of Condat and Leuconne. Monk at the Anabaric monastery in Ireland. Priest. Ninth-century bishop of Verdun (in modern France). Travelling preacher throughout Italy. Martyr.